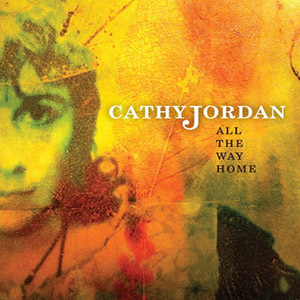 Cathy Jordan’s All The Way Home is the debut solo album by long time member of the multi-award winning Irish traditional band Dervish. It re-introduces ballads handed down through generations that she has performed with family and friends since childhood, preserving the traditional methods with contemporary energy that finds the ground common to all generations. The album was produced in Sweden by acclaimed producer, multi-instrumentalist Roger Tallroth and, in addition to Tallroth (guitars), features many of the most notable names in the folk world, including Gustaf Ljunggren (lap steel/banjo/piano), and Lars Andreas Haug (tuba) of Norway, along with Ireland’s Andy Irvine (mandocello, bouzouki), Michael McGoldrick (uileann pipes), Rick Epping (concertina/harmonica), Seamie O’Dowd (fiddle), Liam Kelley (flute), among others. Two new songs bookend Cathy’s career up to the present: “The Road I Go” (written with Brendan Graham) speaks of restless youth longing to see the world, while “All The Way Home” closes the album with the opposite story, the realization after seeing the world that ‘home’ is where the heart belongs. All The Way Home reaches across generations and musical genres...with tracks such as the other-worldly production of the traditional “Eileen McMahon,” a duet with Scottish singer-songwriter Eddi Reader. 1. The Bold Fenian Men(Trad. Arr. Tallroth) My mother would sing this song while sweeping the floor or putting down the dinner. It was written by Peader Kearney who also wrote the Irish National Anthem, and is about the men who fought in the 1916 Rising, which changed the course of Irish history. 2. Eileen McMahon (Trad. arr. Jordan/Ljunggren/Tallroth) I have recorded this song on a Dervish album but somehow it couldn’t be left off this recording as it was a party piece of my father’s, I heard him sing it hundreds of times but never tired of it. On this version I’m joined by beautiful vocalist Eddi Reader. 3. The Road I Go (Brendan Graha/Cathy Jordan, arr. Tallroth) This is the first song I wrote with my long-time friend Brendan Graham. WE often spoke of writing a song together and this, hopefully, is the first of many to come. It’s inspired by my leaving home for the first time. 4. The River Field Waltz (Cathy Jordan, arr. Tallroth) Every field, barn, road, and bridge has a name around home. I named this tune after one of my favorite fields. 5. In Curraghroe (words Patrick Devine/music Cathy Jordan, arr. Tallroth) This is part of a poem I put to music. It was found in a neighbor’s house years back and speaks of the area where my mother was born and where I went to school. I was struck by how similar our stories were even though our experiences were over hundred years apart. 6. Sliabh Gallion Braes (Trad. arr Jordan/Tallroth) This is another song I heard at home. It deals with the pain and loss suffered by evicted tenant farmers in Co. Tyrone. It may be an old song but it has parallels in today’s Ireland given the number of evictions, house repossessions and volumes of young people leaving to find work abroad. 7. The Banks of the Foyle (Trad., arr Jordan/Ljunggren/Tallroth) My uncle Paddy Nealon RIP, used to always sing this Derry song, which was written in 1920 by J. J. McCreevy. 8. The Jordan Jig (Roger Tallroth) This happy tune was composed by Roger especially for this project. 9. Ould Ballymoe (Trad. Arr. Jordan/Ljunggren/Tallroth) My sister Marie always sang this wee song about the man who thinks he has me the girl of his dreams in a field in Roscommon but she turns out to be married with six children. Ah well. 10. The Lark In The Clear Air (Trad., arr. Jordan/Ljunggren/Tallroth) Every Sunday morning there were two masses, one at half nine, the other at half eleven. My parents would go to early mass and the rest of us to the second. This tune was the last peaceful thing we’d hear before she shouts to get up for mass. It was the theme music to a program called Mo Ceol Thú presented by the late Ciarán Mac Muthúna. 11. All The Way Home (Enda Cullen, Cathy Jordan, Ian Smith, arr. Jordan/Tallroth) This sums it all up really. I spent years running away from home in search of something I finally figured out was under my nose all along.